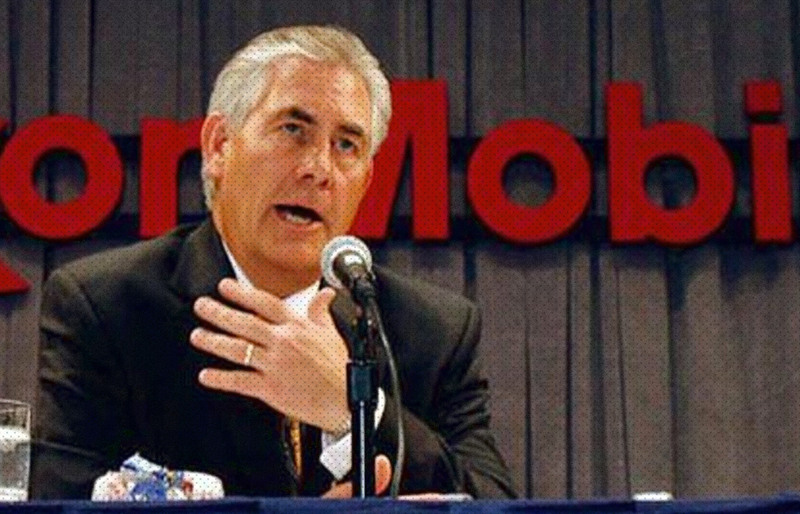 Exxon CEO for Secretary of State? Update: Donald Trump has reportedly chosen ExxonMobil CEO Rex Tillerson for Secretary of State. This is tantamount to putting the world's largest oil company in charge of America's foreign policy. If Exxon takes control of the State Department, they can undo all the climate progress we've made at the international level. They’ll be able to wield the Department as an arm of the fossil fuel industry, opening up new oil and gas development around the world and crushing dissent. But before Tillerson takes over the State Department, he'll need to be confirmed by the Senate. We plan to turn his confirmation hearings into a full-scale investigation of Exxon's decades of climate deception. He'll be under oath in front of the whole Senate. Exxon's coverup is potentially the biggest corporate crime ever, and we'll make sure that Senators are asking every single question possible about Exxon's deception and Tillerson's participation in it. Make it clear to Trump: This is not acceptable. 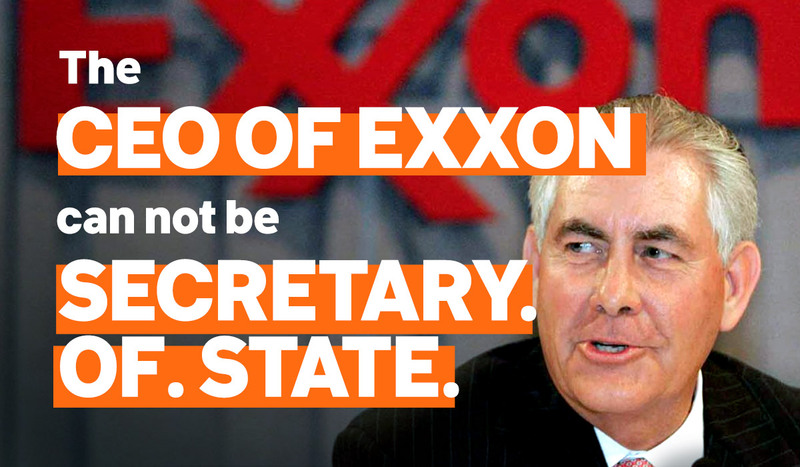 Trump's reported pick of Exxon CEO Rex Tillerson for Secretary of State is alarming and unacceptable. 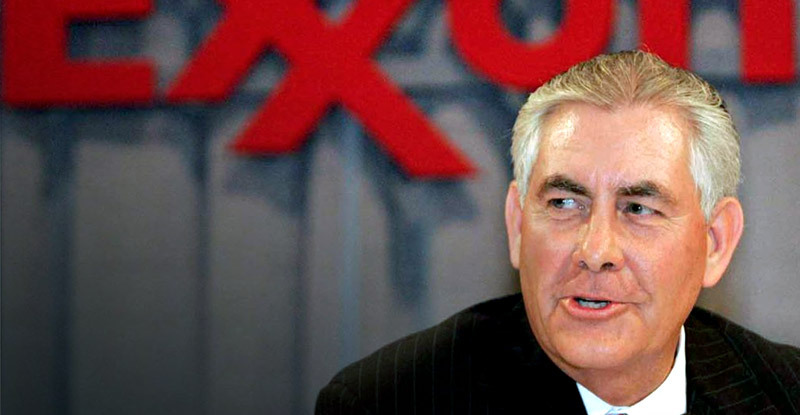 Exxon is a criminal corporation, and Tillerson is wholly unfit for government service. We should be prosecuting Exxon's executives for spreading misinformation and knowingly driving the planet into crisis, not elevating them to the Cabinet. Tillerson still needs to be confirmed by the Senate. A huge public outcry could help stop that from happening. Sign on to stay in the loop. Subject: Exxon CEO for Secretary of State? Thank you for signing! Before Tillerson takes over the State Department, the Senate will need to confirm his appointment. We plan to turn his confirmation hearings into a full-scale investigation of Exxon's decades of climate deception. When Tillerson is under oath in front of the Senate, we'll make sure that Senators are asking every possible question about Exxon's deception and Tillerson's participation in it. Can you help? Chip in to make it all happen. Exxon CEO for Secretary of State? We can't let this happen. We’re going to fight back against Rex Tillerson’s appointment and the rest of Trump’s climate denial cabinet. Tillerson will need to be confirmed by the Senate before taking over the State Department. A huge public outcry could stop that from happening and put Exxon on trial instead.